This, only the second history of any kind to come from a member of Deep Purple, has been a long time coming, four or five years in fact. Worth the wait? Kind of. There has been so much written on and about the group by others (and I’m more guilty than many in this respect) that it is always good to get a fresh perspective on events. Having it co-written promised much but in the end the book is a bit of a balancing act. Glenn’s own narrative blasts along, jumping all over the place at times. Amidst this Joel McIver has interviewed people relevant to the anecdotes being told, and then dropped paragraph extracts into the text. So when Glenn tells of an affair with Cherie Currie from The Runaways, Joel has tracked her down for a chat and a quote. It works on one level, but you can’t help but wish they’d let Joel have a free hand to do the book, to bring a bit more structure and context to it. An authorised biography as it were. Because the interview quotes are generally very revealing and interesting, where the self-penned material is so self-absorbed as to be quite a turn-off at times. Joel has really done a lot of work and spoken to an awful lot of people, but not enough of it gets into the end product. The first book to emerge from the band was Ian Gillan’s Child In Time, another co-written effort. My lasting recollection of reading it was not the music or the story, but simply of how much of it seemed to centre on how much was drunk on every occasion, as every other story seemed to revolve around it. With Glenn we switch drink for drugs, with much the same result. After a while it just becomes a dull to read about. As a personal catharsis of some sort perhaps there is a place for it, but in the interests of balance could we not have had a little more about what it is that interests most Glenn Hughes fans – the music? As it is the early part of the book is the most interesting, and while short on detail at times, still sheds light on Glenn’s embryonic career through to Deep Purple. Plenty of nice anecdotes to add colour to the bones of the story which I suspect most of us will know pretty well already. The second section, which takes up around half the book, didn’t really hold my attention, detailing as it does the minutiae of the serious post-Deep Purple drug fuelled decade and a half. I must admit I skim read most of it. I’ve never been much interested in drugs, though if I had my way they’d all be legalised and properly regulated anyway (let’s face it society as a whole might as well earn from people’s silly behaviour rather than dodgy crims). It is also strange how we are somehow supposed to find it fascinating when it is a famous musician, writer or artist acting this way, but kids on run-down estates are seen as vermin for wanting to do the same to themselves. Anyhow, once the missing years are dealt with in sometimes gory, or at least scatalogical detail (be warned), the closing section brings the story up to date and is itself guilty of skimming. Glenn gets through the post-addiction years – around twenty in total (and almost as many albums) – in just twenty pages. I wrote more than that for the sleeve notes of Play Me Out. Surely there was more to be said about a series of solo projects which produced some of the best post-Purple tracks out there? I must also admit to a raised eyebrow when the 9/11 attacks are seen as a problem as they delay the start of the Hughes Turner Project sessions! I’m sure – or at least I hope – that it wasn’t meant to be put in such a way, but where was the editor? Questions, questions. Not really what should first spring to mind after a good biography. In the end then, a book which certainly could have been a lot more detailed and interesting for us Purple hard cases. After all I can’t really see what other audience there is out there for this book, Glenn not being quite in your celebrity household ‘my drugs hell and back’ league. A few people have said to me ‘what an ego’ after reading the book, but I’m only surprised that they were surprised. It takes an ego to be able to get up on stage and perform like he does. To balance this Glenn also had and still has a lot of talent to go with it, and it is this which makes him one of the most interesting of all the Deep Purple musicians these days. But perhaps not the best scribe. I had to force myself to finish reading the book. Time was when I would have walked the country to see GH perform. Not anymore. The ego has landed. There is an interesting Glenn biography to be done, this sure wasn’t it! I loved this book so much that I’ve read it three times and I usually go back to it. 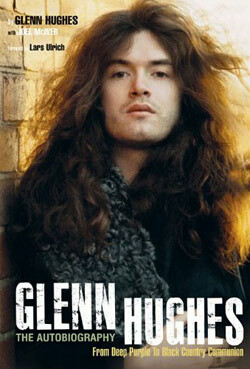 As a huge fan of Glenn Hughes I found it very interesting. But it is true that there are unexpected and unfair ommisions like, for instance, the swedish band formed with ex-Europe members with whom Glenn made his final comeback and, as well, two albums. Nobody from such an important period is even mentioned. J J Marsh is almost ignored even tho he’s been working with Hughes for many years. Same thing with Phenomena which is very appreciated by his fans. And Black Country Communion as overestimated as the talent of Joe Bonamassa. I would have loved to read much more about his post Purple years. The stories he told are very interesting and addictive and I think he could perfectly write a second part just for the die hard fans like me. Glenn Hughes is clearly the man of the moment in terms of all that has happened and been created post-Deep Purple (I am talking of the original Band/s 1968-1976). Look at the enormity of his achievements both in excellent solo albums, live albums, and BCC! Anyone just has to listen to Cold. The new album looks amazing – there is a good introduction I think via the Fireworks site to a track by track overview of AFTERGLOW, the latest BCC album. just happy I didn’t lash out on the £500 version, its awful. While I actually did find this a can’t put down type of book, and I did enjoy reading it, afterwards I did feel disappointed. The magic of what makes Glenn amazing seems to be pretty much absent, as well as how most of the music was made. The solo career gets all too short shrift, and don’t forget he spent 12 years making albums with guitarist JJ Marsh, who’s mentioned in one sentence, as “My guitarist JJ Marsh”. And the book has not one bit of humour, you won’t laugh once. Surely Glenn has had some silly fun – all musicians want to be comedians. At 250 pages it’s way too short as well. After reading Keith Richards’ book all others just read like magazine articles. Iommi’s book seems to get the balance right as well. I agree with the main review. It was just so dull in parts. I was really looking forward to reading this but found it to be a let down. Tommy Bolin was literally mentioned almost in passing and some of Glenn’s great solo albums are merely mentioned in one line. No Blackmore info either. Such lack of focus on the music and how it was put together I found astonishing. The drugs stuff is all well and good and obviously it is a personal triumph for Glenn to have overcome them. But is it of interest to a reader? I think not. Oh, and at one point he claims that he wanted to get his solo album out ahead of the “Paice Ashton & Lord” album which he referred to in a negative context. The PAL album was a masterpiece, way ahead of it’s time. He refers to his own “Play me out” album as a “genius record.” It had some nice moments but was also a bit of a mess in places. PAL won that round in my opinion but Hughes has done some great work with BCC – love the DVD. There was a very strange lack of Blackmore in the book too! Didn’t he ignore the “Phenomena” album in the book too? I am reading Bill Bruford’s book currently… what a difference in content and style. This is a serious book full of insight and content. Speaking of books. Colin Hart’s book doesn’t appear available here in the US. I would like to read this. Why is it impossible to find!? It’s on several mail-order sites, including our very own DTB shop. I guess they’re waiting for US distribution at the moment. Couldn’t agree more with your review Simon. I received my copy as a Christmas present and anxiously sat down to read it the next day. Spot on observation about it being so much like Gillan’s book, where you simply exchange alcohol for drugs. Neither man made any attempt to explain or clarify the songwriting process, what things inspired them or anything else. Both seemed to relish in the details of their particular drug of choice and how it affected them. They also both seemed to boast about their stamina for substance abuse, while condemning it at the same time. I found myself more annoyed at the poor flow of the book and lack of any substance than I was at anything that actually happened IN the book. I do think that Glenn’s ego is much larger than Gillan’s, as hard as that may be! I got very sick of reading how Glenn was blessed with the good looks, incredible voice and amazing bass playing ability, and how he threw it all away. It wouldn’t have been bad if others had been saying it, but Glenn said it over and over about himself! More on the music generally would have presented a better balanced read. The post Play Me Out era ‘Fools Condition’ sessions & the shelved Warner Bro sessions. No touring behind ‘Fused’ ? I would rather see Glenn & Tony do some live gigs together than see critically acclaimed BCC to honest. I understand the Dio=bums on seats argument. Glenn’s pharmacutical laspses in the 90’s are refreshingly honest & brave to admit. Great acoustic gig in London to promote the book. Indeed, Glenn is my musical master, but to see this person’s problems in full length of circa 25 (’73-’98) years makes me very deeply sad about him for witnessing all of this mess. But reading it gave me some laughing points, not laughing at him, but about the writing style of this or that impressive occasion in his life. It gave me a lot of points to think and last but not least the impression of a man who ran into a lot of trouble and unfinished businesses. Thanks Glenn for publishing this! I’m not sorry about negative things you find in it, Simon. I’m more glad to have read about Glenn in this fashion. I’m a huge fan of you, Glenn, if you read this, and of all the stuff you’ve put out is nothing but genius. Go on the way you are now, and thanks in advance for the next things you will be delivering. Lately, I hear all the ’80’s stuff of you a lot. All Glenn’s fans should do this, too, because here you can hear the foremost depressing stories of Glenn’s life told by the Voice himself in last consequence in this book. I also had mixed feelings about the book. After a while, it became almost oppressive as we’re crushed by one drug story after another. I know this journey is very important to Glenn, especially now as he’s risen above the problems (and I have a lot of respect for that). But with one drug story after another, it got old fast. As a huge fan of Glenn’s music, I was hoping for more details on his solo work, something that always seems to get lost between the Purple history and whatever he’s doing at the moment. For the most part, those albums get a mention but only related to whatever state of (non) well-being he was in at the time. I guess books like that don’t sell well, at least in terms of an autobiography. I suppose an album-by-album analysis is best done by a third-party and yet it’s the artist that can really give you the details. Again, I’m a fan of Glenn because of the music, not because of his past drug use. I’ve read four rock autobiographies recently… Glenn’s, Iommi’s, Ace Frehley’s and Herman Rarebell’s. Ace’s was actually one of the best and he also lived a drug-filled life. But he did a better balancing act of mixing those stories along with his music and what was happening around him at the time. The book is not just for Deep Purple fans, who let’s face it, are diminishing in numbers as the years go. It has a ‘mass market’ appeal and is a compelling read for anybody (and not only Rock fans at large). Glenn Hughes was only in Deep Purple for 3 years whilst his career has spanned 5 decades. He is the only member of the ‘DP’ family tree making music that is still relevant in todays market. I generally agree with Simon’s points. I read Tony Iommi’s biog just after Glenn’s book and the contrast was startling. Iommi had the sense of humour to retain a perspective on what (to outside eyes) can often seem a ludicrous and bizarre music industry. However, what both books needed was someone to push and prompt at various points, embellishing often throw away comments, so the real fans could get a feel for the times and a context for happenings which to many readers were before they were born! Simon, I did a short review on anther site and came up with the same views as yourself… Maybe he could have titled it: “You are the music, I was the drugs”!? I looked forward to reading about all the different multitude of projects he has been involved with and was disappointed somewhat. Maybe now that he got that out of his system, someday he will write one about the music. I also hope he quits referring to himself in the 3rd person sense!